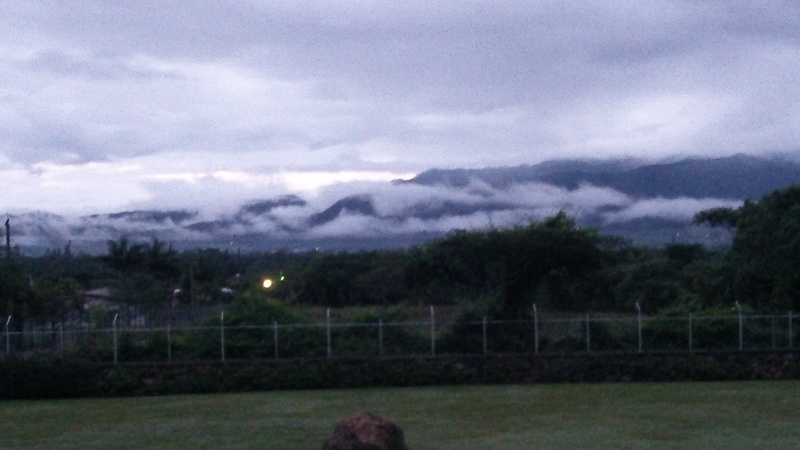 This is the view from our mission home in Zamorano Valley. My second home. Boy how I miss this place. It is not just the view that I miss. Serving with a team of Christian brothers and sisters is refreshment to my soul. Eating, sleeping, studying, sharing, and worshiping together. As a dear friend said, this is about as close to heaven as we are going to get on this earth. The last night, many of us went outside to our “place”. A porch/balcony on the second floor of the mission home. All voices singing and worshiping God. Yep, I could do that for eternity. I said in my last post that God shows me something every time I go to Honduras. This time He showed me that I definitely need to spend more time in His presence. As another friend shared in small group this week, we cannot stay on our spiritual “high”. We must come back down the mountain. This is how our relationship with God works while we are on earth. Coming down the mountain is hard (literally and figuratively). If I want to shine, I have to be more intentional than ever about spending time with Jesus. I am leaving tonight for Honduras. This marks 10 years that I have been traveling to Honduras for missions. Wonder what God is going to teach me? Every year He reveals Himself a little deeper. We say “God will never give us more than we can handle.” I believe more than situational (cancer, infertility, death, job loss, etc), that He won’t reveal more of Himself than we can handle. When I travel to Honduras, I hear Him in a more clarified way. Like Jesus going away to be by Himself for days to talk to His Father. This verse was painted on the side of a church we passed. I felt it a little prophetic, as we were looking forward to our trip to China to get our boys. Once we got them, we would mourn no more. God would set them free. To Him be the glory. Please pray for our team and the people of San Miguelito, Honduras. I hope to post some updates from the field. I know that has been mine in the past. Not a very loving response, I must say. Have you ever heard that said of something good that has happened to someone? No, this is NOT what I asked for. It is so much more. The blessings I have been given. The miracles I have witnessed. Yes, I get tired. I am human. Other people get tired because they work too much, party too much, worry too much, etc. I prefer my reasons for being tired.